RATON – New Mexico Department of Game and Fish conservation officers are seeking information in several unsolved poaching cases. Rewards are available for information leading to charges being filed in the following cases. 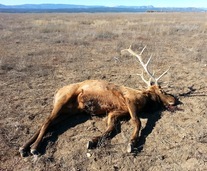 A game warden found a dead cow elk about 80 yards off the south side of N.M. 283, outside of Las Vegas, N.M., March 27. The animal had been shot in the head with a .22-caliber bullet and left to rot. Four .22-caliber shell casings were found at the scene. A month earlier, officers found a dead, bull elk that had been shot and left to rot alongside the same highway on Indian Head Ranch property. Officers collected four shell casings and two bullets as evidence. A $750 reward is being offered in this case. Officers documented four separate incidents in which someone armed with a crossbow shot deer in the Angel Fire area in late 2015. Game wardens discovered the first two deer Nov. 23 and 25. An arrow had apparently passed through one deer and struck another that was found dead with the shaft through its neck. Two other deer were found in December that also had been killed with a crossbow. A $500 reward is being offered in this case. A $3,000 reward has been raised for information leading to the identification of poachers who killed two bull elk and left them to rot at Las Vegas National Wildlife Refuge on Nov. 20, 2015. The Department of Game and Fish, Friends of Las Vegas National Wildlife Refuge, area landowners, businesses and residents put up the money for the reward. The dead elk were discovered in an area of the refuge frequently used by hikers, birders and photographers. Anyone with information about any of these or any other wildlife crimes is urged to call the department’s toll-free Operation Game Thief hotline, (800) 432-4263. Callers can remain anonymous and may be eligible for rewards if charges are filed. Reports also can be submitted anonymously online at www.wildlife.state.nm.us/enforcement/.